As is normal this time of year, the British media begins whipping up a frenzy – the ‘cold weather’ frenzy. If the media is to be believed, we are set of temperatures of – in parts of the country at least – -12c. Minus TWELVE! 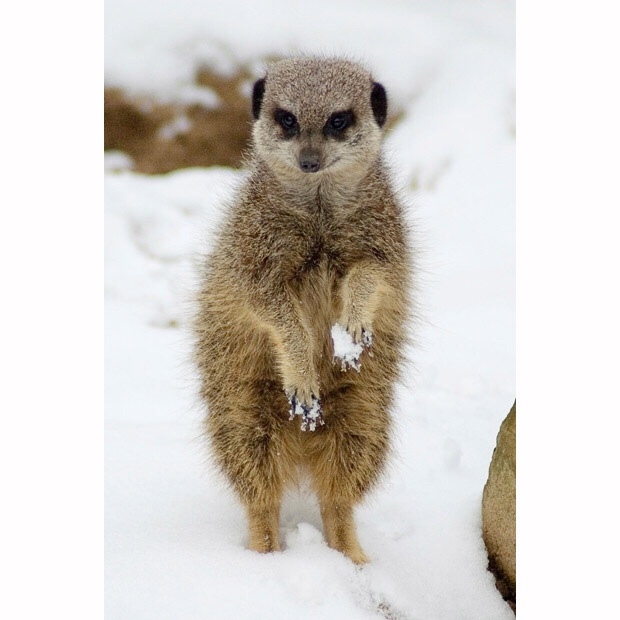 That’s one cold meerkat. Still, as the press has predicted icy weather since… November, I am not too worried, though the flakes of snow we had earlier today mean we can’t throw caution to the wind! After all, this country has an uncanny ability to paralyse itself whenever there’s a bit of snow. We talk of handling no-deal Brexit but grind to a halt when the icy white stuff falls… ahem, so yeah, we might get a cold snap and soon. I hope not, for meerkats are not geared up for cold weather, though that said, the 35c heat we had in summer was simply too much. Is a happy medium – 22-25c – not too much to ask for? I’d settle for 15c right now! The chill has certainly been in the air, even with bright sunlight. My fingers have turned white, saved only by the mercy of typing quickly to keep the blood flowing. I actually fared reasonably well, all things considered, since I spent a lot of time on a bus today, though the flipside of that experience was to feel faintly queasy, as the route involved a lot of country lanes and winding roads. I’d sooner avoid a repeat experience of that. Give me trains any day, though where I had to go meant trains were impossible, sadly. My trip was to the heart of Essex, the city of Chelmsford, a beautiful city in fact, one that is very old in parts. It doesn’t seem old, but it is, not least of all given a bit of Roman heritage. I can’t divulge the exact reason for my trip, not yet anyway, but I enjoyed it – it was different, aside from the cold and the nausea. I’m not selling this idea am I? Anyway, time to indulge in some Super Mario Maker. Take care all! Man. I really need to learn Celsius. I vaguely understood -12c, because I know (erm, think?) 0c = 32f. In that, c makes waaaaaaaay more sense. I know only one thing – it’s about to get very cold! Or maybe it won’t. Our media gets hysterical over snow! Oh man, same here! They were talking about how we were gonna get all this snow this past weekend, then it was gonna freeze & it would be terrible. Well, nope. Yeah, it’s bitterly cold, but there’s been no real precipitation.